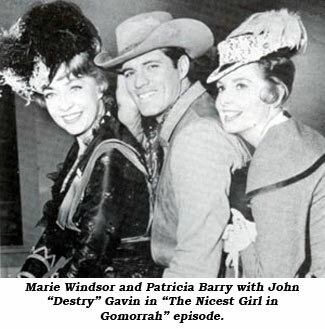 Everyone remembers the Tom Mix, James Stewart and Audie Murphy versions of writer Max Brand’s peace-loving son of a famous lawman, Destry…but do you remember ABC’s short lived 1964 series of “Destry” starring John Gavin? Universal was having great luck on TV with westerns (“Virginian”, “Wagon Train”, “Deputy”, “Restless Gun”, “Laramie” etc. ), why not revive a character they’d had great success with in movies, Destry, toss in a bit of “The Fugitive” and a little “Maverick” and star 6' 4" John Gavin as TV’s “Destry”. The premise had Gavin as soft spoken, mild mannered Harrison Destry, son of famed lawman Tom Destry, to clear his name, searching the west for Charlie Bent, the no-good responsible for sending him to prison on a bogus embezzlement charge. Like his famous father, TV’s Destry is not exactly a coward, but was very careful with his hide. Like Gavin, Destry is an intelligent conservative who holds his fire until he’s had a chance to study the situation. 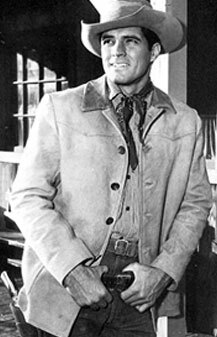 But in a western TV landscape filled with tough cowboy heroes like Clint Walker, Ty Hardin, Chuck Connors, Ward Bond, Steve McQueen, Robert Fuller, James Arness, Dale Robertson and others, perhaps the light-touch low-key tameness was out of favor with the viewing public. At any rate, the lighthearted one hour, b/w, Friday night (7:30-8:30 EST) series failed to gain an audience and only ran for 13 episodes from February 14, 1964, to May 8, 1964, with repeats til Fall. Universal tried Gavin in the TV Navy drama “Convoy” in ‘65, but it also flopped. Gavin continued to act sporadically up until 1981, but concentrated more on his business interests in Panama and South America. He served as President of the Screen Actors Guild from ‘71-‘73, married actress Constance Towers in ‘74, and was appointed U. S. Ambassador to Mexico by President Reagan in ‘81. Although short-lived, the well done “Destry” deserves more recognition—hunt the DVD collection and give it another look.